The robust phone with integrated answering machine , built to stay protected in life’s many situations. The Gigaset E495 is the tough telephone from Gigaset. Resistant to water splashes, shocks and dust, it can survive in any environment, from the most hectic of homes to the dustiest of workshops. Easy to handle, this phone has an illuminated colour display and keypad for faster navigation. Thanks to a vibracall setting, it even vibrates to let you know a call is coming. Speaking is a pleasure on the comfortable handset. Or when you need to do two things at once, you can experience advanced hands-free with great sound quality or use the helpful headset connection via 2.5mm jack. With talk-time of 12 hours and an extra long standby time of 250 hours, the Gigaset E495 is simply dependable. It comes complete with a built in answering machine with up to 45 minutes recording time and remote message playback. And if you pay attention to the environmental and financial impact of your energy use, you’ll be pleased with the Gigaset E495’s radiation-free¹ and energy-saving ECO DECT technology. With ultra practical features and a durable outer shell, the Gigaset E495 is the steadfast phone with answering machine that withstands the vigours of even the most demanding days. The Gigaset E495 comes equipped with an answering machine with an impressive recording time of up to 45 minutes. This dependable phone does all it can to let you know when a new message is waiting, from displaying notification on the handset to sending an SMS² notification to an external number. When you want to hear your messages, whether doing so from somewhere else with remote message playback or at home via the handset, stay informed with voice announcements of message time and date. And for added convenience, the trusty answering machine of the Gigaset E495 can even record your telephone calls. The Gigaset E495 is built for individuals that need a sturdy phone they can trust, from families to craftspeople. Shock proof, splash proof and resistant to dust, it can cope with all practical environments. Long standby time of up to 150 hours means it doesn’t need constant charging at the base station, so the handset can stay in your pocket as you complete your tasks. And thanks to vibracall, you can feel a call coming as well as hear it – perfect for noisy places. When you need to do two things at once, you can get the job done with advanced hands-free or use a headset via the Gigaset E495’s 2.5mm jack connection – always in brilliant sound. With its robust design, answering machine and advanced hands-free the Gigaset E495 offers an efficient way of staying in touch. You can also enjoy fuss-free navigation thanks to the user-friendly interface, clear menus, and illuminated keypad and colour display. Save time even further by storing the details of up to 150 important contacts on the Gigaset E495’s spacious phonebook. With a talk time of up to 10 hours you can speak for a long time on the Gigaset E495. If it makes life easier to have a phone in every room simply expand your system by adding extra handsets, and talk in brilliant sound quality everywhere. 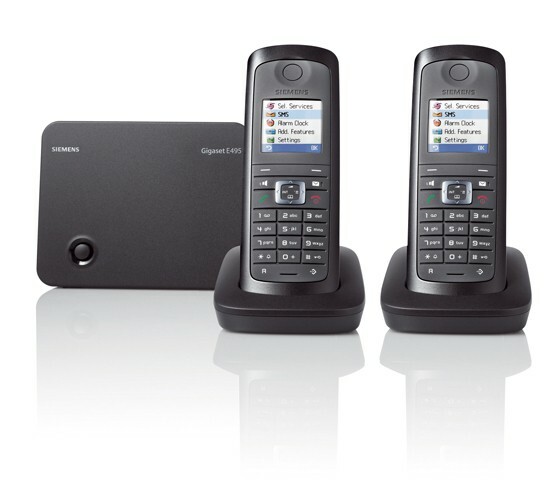 The Gigaset E495 accommodates up to 6 additional handsets with ease. The energy-saving power supply of the Gigaset E495 consumes less electricity³, so it saves you money and is better for the environment. Like all Gigaset cordless phones, it also variably reduces the transmitting power from the handset to base station depending on their distance apart. You can also reduce the transmitting power of the Gigaset E495’s base station by 80%* simply by selecting the ECO Mode. Furthermore, radiation-free** ECO Mode Plus slashes the transmitting power by up to 100% when the handset is in standby. This way, you can enjoy a more energy-efficient way of staying connected with your family and friends. Splash proof, dust proof and shock resistant, the Gigaset E495 has the brawn to withstand whatever situation comes its way. This tough telephone with answering machine fits in perfectly with hectic lifestyles, giving great sound quality on every call.